Niagara Falls has long been known as one of the best places to hold a wedding and as a romantic honeymoon destination. In fact, Niagara has been one of the most popular honeymoon destinations in North America for over 100 years. However, Niagara can also be the perfect place to pop that all important question. If you’d like to stage the proposal of a lifetime, consider one of these perfectly romantic spots in and around Niagara to propose to the love of your life. Recall the scene from the US television series “The Office” when Jim and Pam secretly fled their planned wedding and got married on a boat under the falls? Yes, that’s the type of romance that this cruise can evoke. When you plan your visit to Niagara Falls, be sure to contact the Hornblower Niagara Cruises (formerly Maid of the Mist) reservations agents beforehand and inform them of your plans. 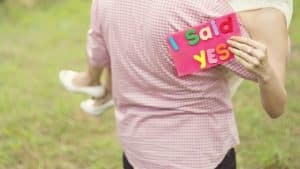 It’s likely they’ll be more than happy to help you with the details that will make your marriage proposal one that you and your partner will remember for a lifetime. Consider a night cruise so the fireworks and the brightly lit falls can serve as a spectacular backdrop for your special occasion. There’s nothing quite as romantic as a ferris wheel at night, but the Niagara Skywheel is no county fair thrill ride. This incredible structure brings riders 175 feet into the air for an unobstructed view of the falls and the surrounding area and in the evening it’s especially spectacular. Ask the ride operator to stop your Skywheel cart when you’re at the top to ask your big question. If you feel that your partner might catch on, enquire with the concierge at your hotel. They can often call ahead and inform the operators of your secret plan. This bridge not only connects the United States and Canada, but it also offers a spectacular view of the falls, especially at night. This can be an incredibly significant spot for a marriage proposal, as it is literally the place where two countries come together. Be sure that your partner isn’t the type to get easily embarrassed in crowded situations as the Rainbow Bridge in Niagara is wildly popular and is generally crowded at all times of the day. That being said, there’s nothing quite like a marriage proposal to melt the hearts of complete strangers, so you’ll have a delighted crowd of onlookers when you get down on one knee. Making the choice to propose to your partner is a big step, and in the age of flash mobs and live streams, the pressure to make a proposal extra special is real. Niagara Falls is the perfect place to make your proposal unique and special in a stunning location. Choose the ring, book your hotel room, and take the plunge. You’ll always be able to have fond memories of your life-changing experience in Niagara Falls.